In today’s (08/03/2012) Bing Webmaster tools newsletter, I received the announcement that Bing has officially rolled out two new features that look very handy. These features are a keyword research tool as well as an API to access your Webmaster information through code. I am including the email text below. The actual feature release, however, happened earlier this year on 2/27/2012. Here is a link if you’d like to get the scoop from the Bing.com community announcement. In particular I am interested in playing around some more with the keyword research tool. I have included a screen capture with this article to show what the keyword research tool looks like. At first glance it appears quite similar to Google’s keyword research tool, but on closer inspection it does have some interesting features unique to this tool. As you can tell from the screen capture of the Bing keyword research tool, you have options to narrow down your keyword research by Country or language and you can also view your past research history, which consists of your past 25 queries. The tool will show you impressions for your keyword phrase and will also suggest related phrases. I really like the small historical chart of past impression popularity that appears beside each key phrase. Apparently the keyword research data is an aggregate of the past 6 months, and one can easily change the time range for the data through two time filter dropdown lists on the search. The nice thing about this tool is that it will show keyword data without any sort of filter, so this is the real deal for what people are searching for. An interesting point is that there is a two week latency for the keyword data being shown, which means the keyword research information you see is at best two weeks old. I’m also starting to have a look into what functionality Bing has made available through their Webmaster Tools API. They do not allow an interface to messaging or keyword research data, but other Webmaster functions can be queried. Here is the link to the Bing Webmaster Tools API documentation. Some of the functions look to be quite useful. 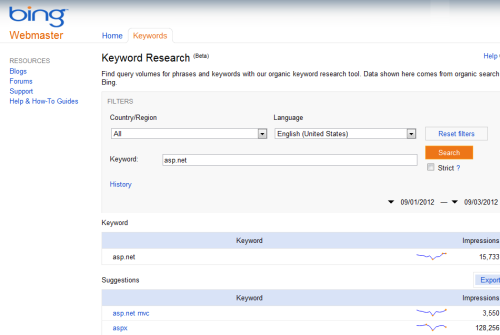 Keyword research tool: This tool allows you to perform keyword research on any phrase you enter. Log in to your Webmaster Tools account, enter a phrase into the tool and you’ll be able to see query volume data across different countries, languages and for related phrases. Data within the tool is exportable, and we hold a history of up to 6 months for all phrases. Query data shown in results within this tool are based on organic queries from Bing worldwide. All data is raw and not rounded in any way. Bing Webmaster Tools API: Starting in February the data you currently see in your Bing Webmaster Tools account is also available through the new API – allowing you to use your data in other locations. An exception to this is account messaging, which will still only be available inside Bing Webmaster Tools, although you may also set up email alerts to see any messages we post to your account. Please send us feedback or questions using email support – we’re excited to hear what you have to say about our February feature updates! That sounds great! Good news for developers! Yes, it’s definitely good news! I’m looking forward into trying out their API.